This is what’s left of a star that exploded thousands of years ago. 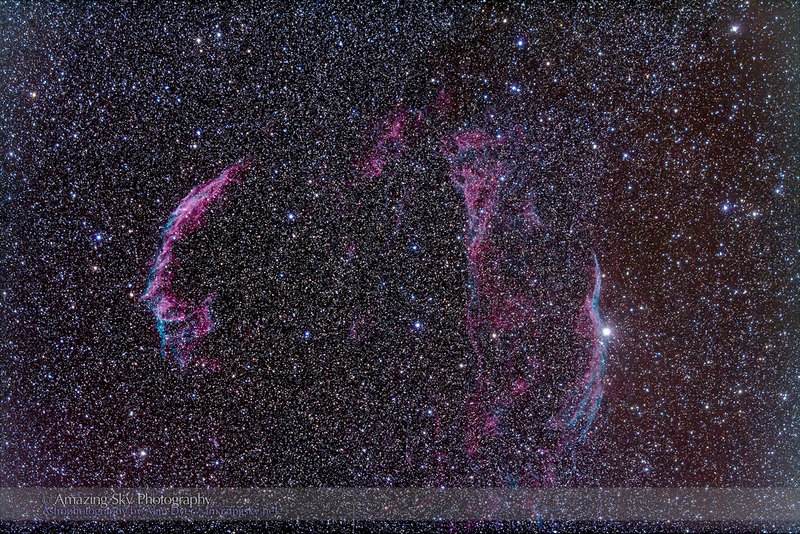 I shoot this object every year or two, so this is my 2013 take on the Veil Nebula. For last year’s see Star Death Site, a post from September 2012. The Veil Nebula is a supernova remnant. The lacework arcs are what’s left of a massive star that blew itself to bits in historic times. This object, one of the showpieces of the summer sky for telescope users, is now high overhead at nightfall, off the east wing of Cygnus the swan. I shot this a couple of nights ago using a 92mm-aperture refractor that provides a wide field of view to easily frame the 3-degree-wide extent of the nebula. 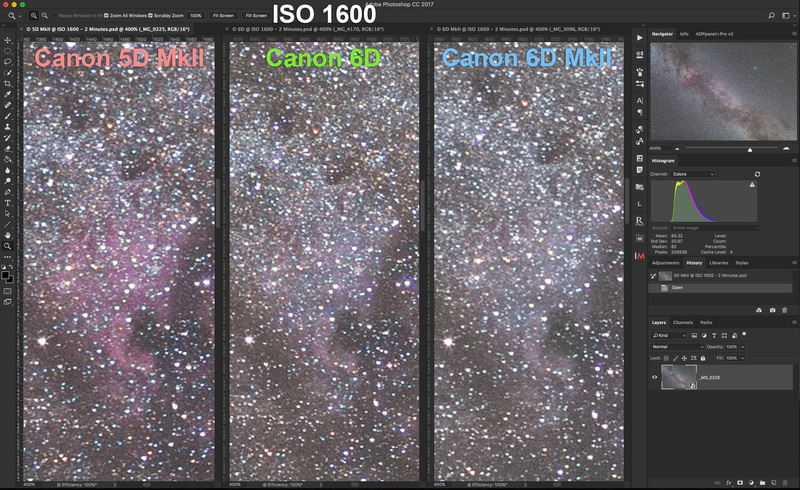 The image is a stack of five 15-minute exposures with a filter-modified (i.e. red sensitive) Canon 5D MkII camera at ISO 800. 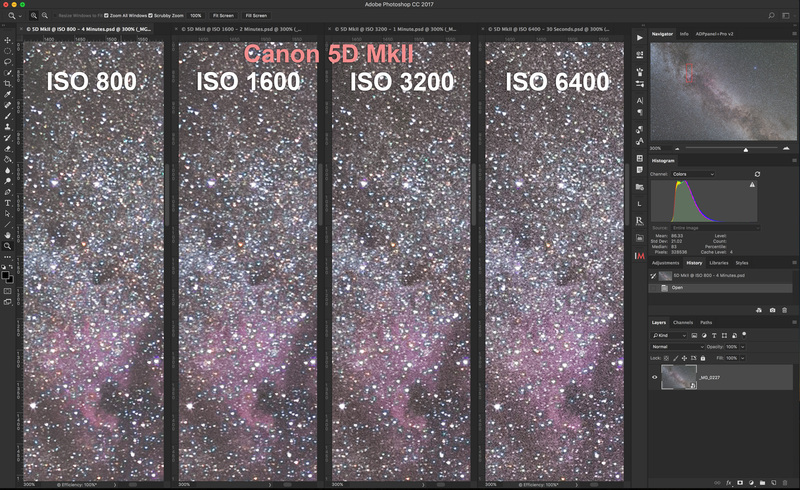 Stacking the images helps reduce noise. The colours in this object make it particularly photogenic, with a contrast of magenta and cyan. 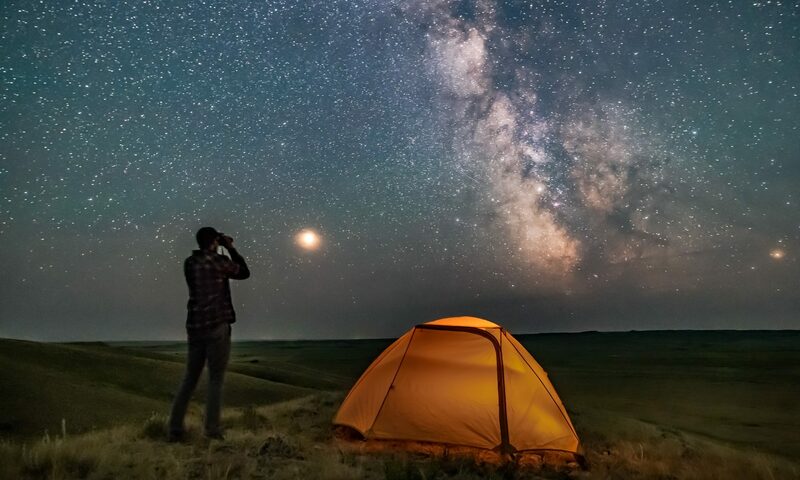 At right, a sharp-edged area of obscuring interstellar dust tints the sky brown and dims the stars. A cocoon of glowing gas sits at the tip of a dark cloud of interstellar dust. It’s been months since I’ve shot more “traditional” astrophotos, meaning images of deep-sky objects through telescopes. But the last couple of nights have been excellent, and well-timed to the dark of the Moon. This is the Cocoon Nebula in Cygnus, aka IC 5146. It is a cloud of gas about 4,000 light years away where new stars are forming. They are lighting up the gas to glow with incandescent pink colours. The Cocoon sits at the end of snake-like dark nebula known as Barnard 168 which, in the eyepiece of a telescope, is usually more obvious than the subtle bright nebula. Photos like mine here, with long exposures and boosted contrast and colours, make nebulas look much brighter and more colourful than they can ever appear to the eye. For the technically curious, I shot this with a 92mm diameter apochromatic refractor, the TMB 92, and a Borg 0.85x flattener/reducer, a combination that gives a fast f-ratio of f/4.8 with a very flat wide field. 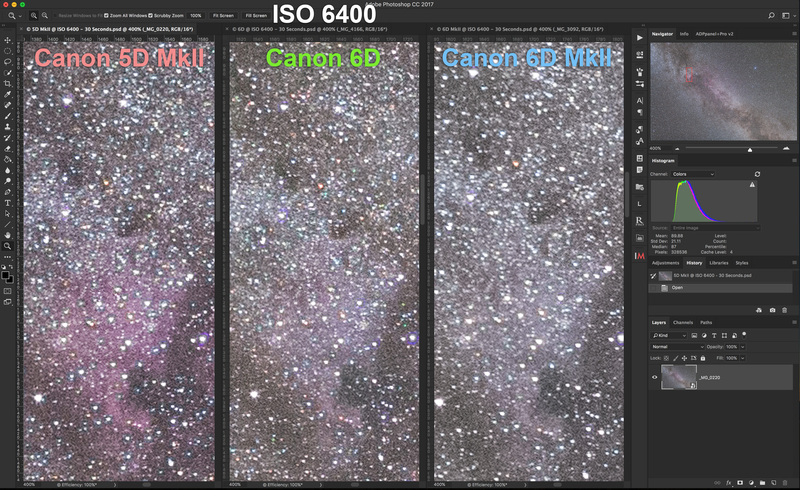 I also used my now-vintage filter-modified Canon 5D MkII at ISO 800. 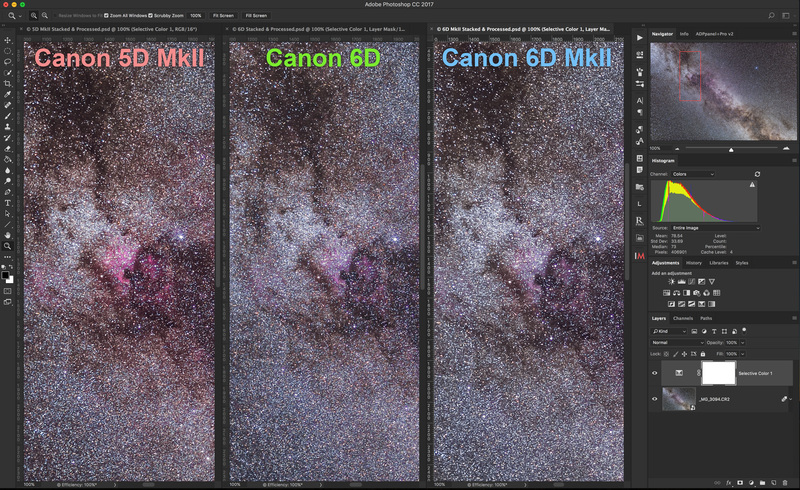 This is a stack of five 12-minute exposures, registered and median-combined in Photoshop to smooth out noise. All processing was with Adobe Camera Raw and Photoshop CC. The telescope was on an Astro-Physics Mach 1 mount, flawlessly autoguided with an SBIG SG-4 autoguider. 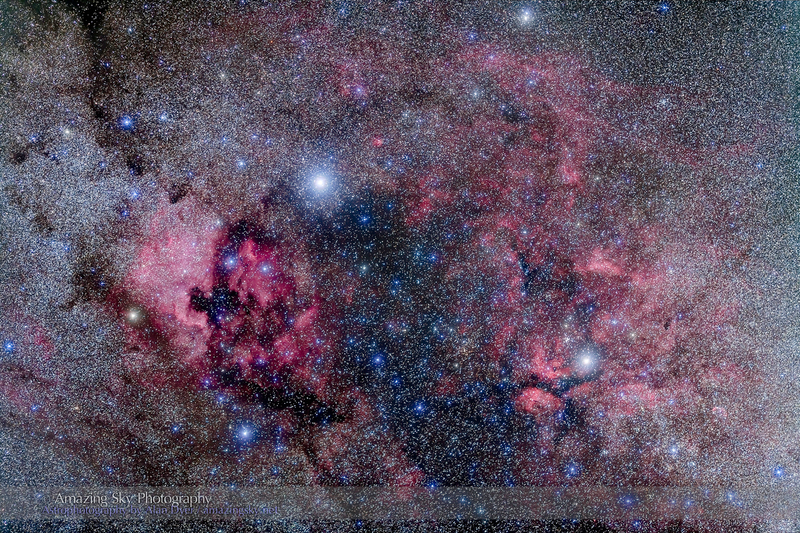 The centre of Cygnus is laced with an intricate complex of glowing gas clouds. 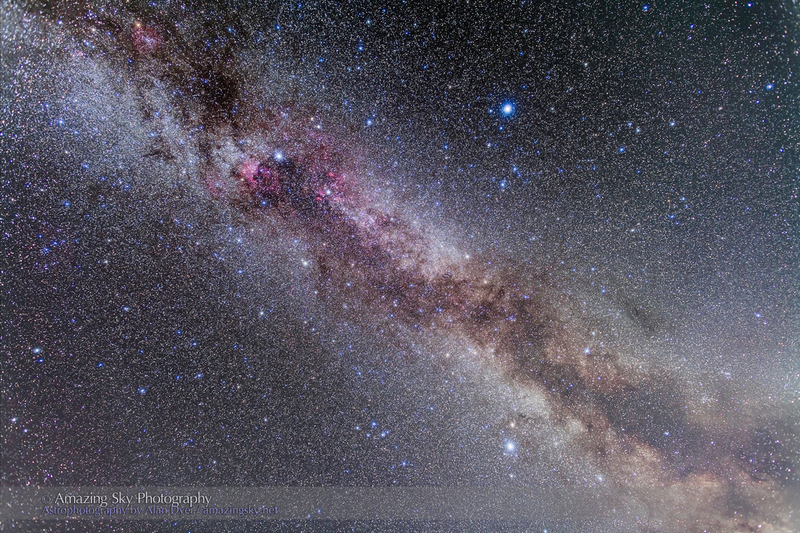 This is another shot from earlier this week, under ideal skies, in a view looking straight up into Cygnus the Swan. 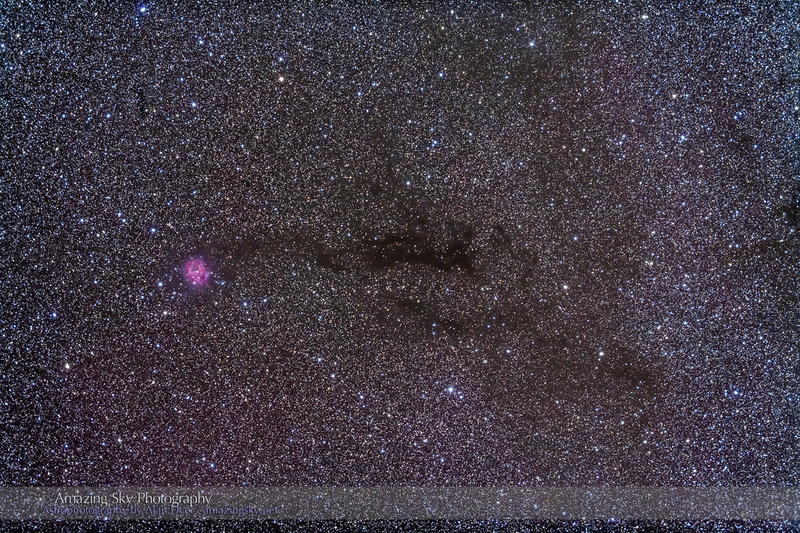 This is a telephoto lens shot of the amazing array of nebulas in central Cygnus, around the bright star Deneb. At left is the North America and Pelican Nebulas. 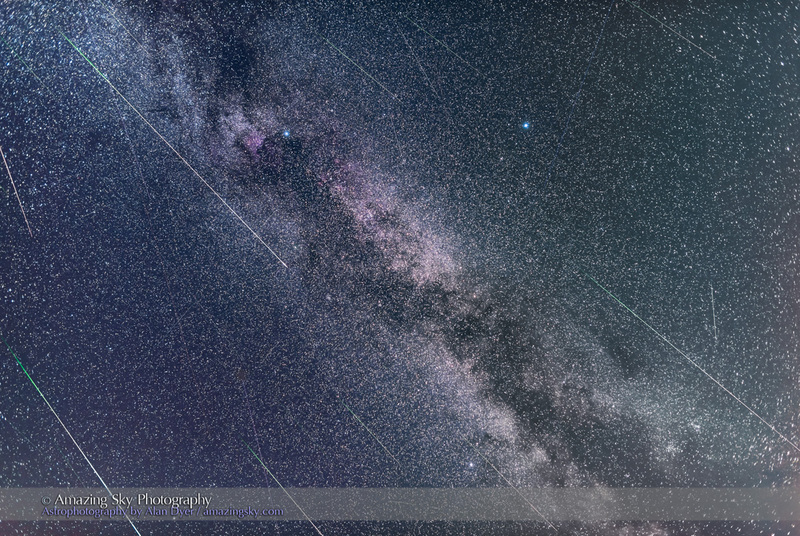 At right is the Gamma Cygni complex and the little Crescent Nebula at lower right. Here we’re looking down our local Cygnus-Orion arm of the Milky Way into a region of star formation rich in glowing hydrogen gas and dark interstellar dust. These clouds lie about 1500 to 3000 light years away. Dotting the field are hot blue stars newly formed from the raw ingredients making stars in Cygnus. At top, the clouds have a lacework appearance, like sections of bubbles. Perhaps these are being blown across space by the high-velocity winds streaming from the young stars. 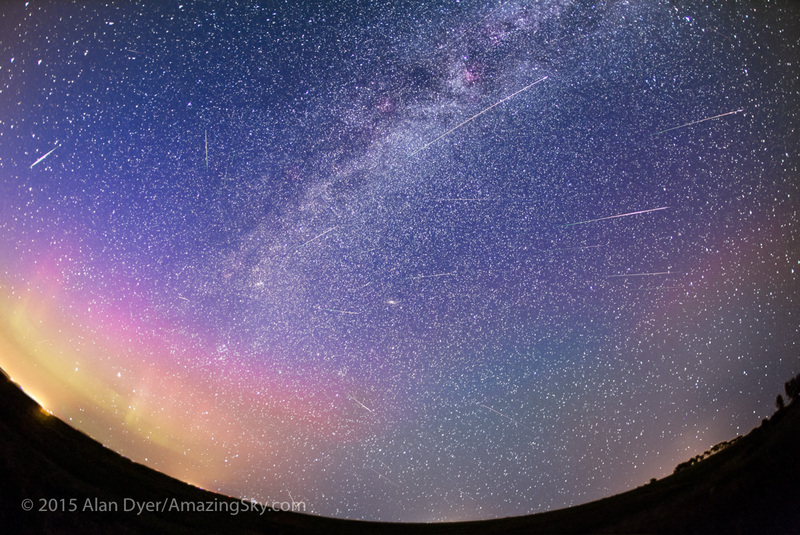 The trio of Summer Triangle stars flank the Milky Way in the dying days of summer. 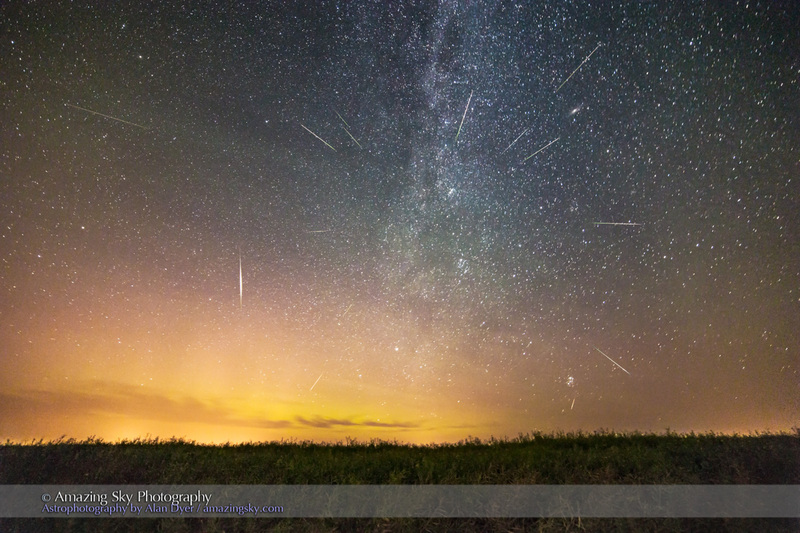 I shot the featured image above two nights ago on a perfect late summer night from home. Skies were dark and transparent, with no aurora and little airglow to taint the sky. The image takes in the Summer Triangle stars of Vega (top), Deneb (left) and Altair (bottom). Vega and Altair straddle the summer Milky Way, but Deneb lies right in the thick of it, way down the Local Arm that we live in. Vega and Altair are nearby normal stars, only 25 and 16 light years away. But Deneb is a blue supergiant, shining from 1400 light years away, and one of the most luminous stars in the catalog. 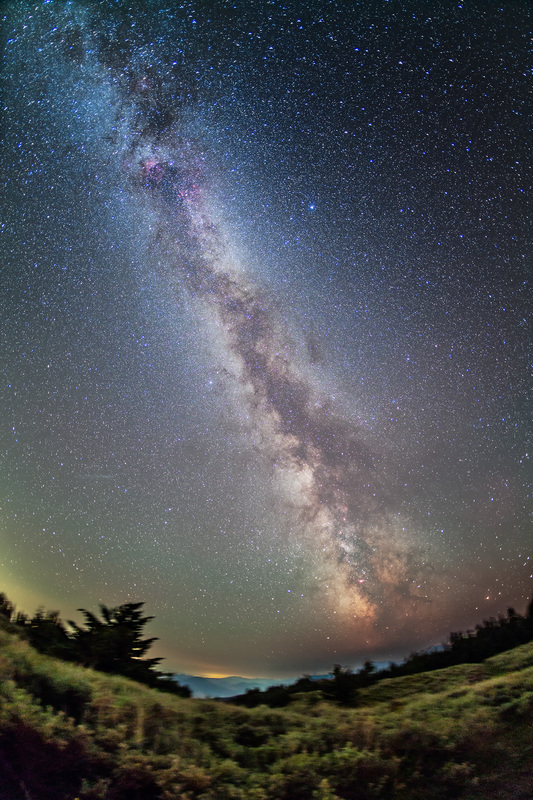 The Milky Way through this area of sky is riven by twisting lanes of interstellar dust. A particularly dark patch sits above Deneb at top left. Then below Deneb the Milky Way gets split by the Great Rift that continues down into Aquila and Ophiuchus at lower right. 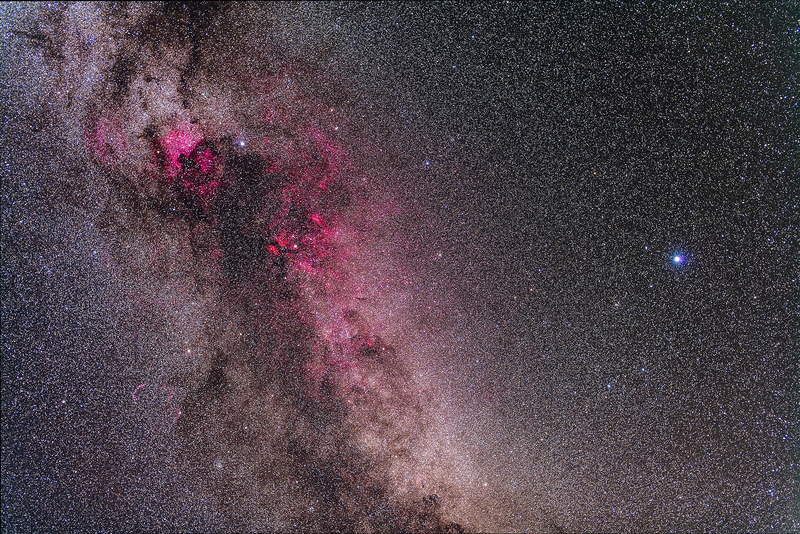 All along this part of the Milky Way, particularly around Deneb, the camera picks up a string of glowing red nebulas where stars are forming. The red comes from hydrogen atoms emitting deep red light, as hydrogen is wont to do. This image is from a couple of nights earlier. I used a wider angle lens to take in the full sweep of the summer Milky Way, from Sagittarius skimming the horizon, to Cassiopeia past the zenith at the top. You can see the Summer Triangle in the top half of the image, the part of the sky now overhead on early September nights from the northern hemisphere. I took both shots with a filter-modified Canon 5D MkII placed on a little iOptron SkyTracker for tracked long exposures (4 to 5 minutes). 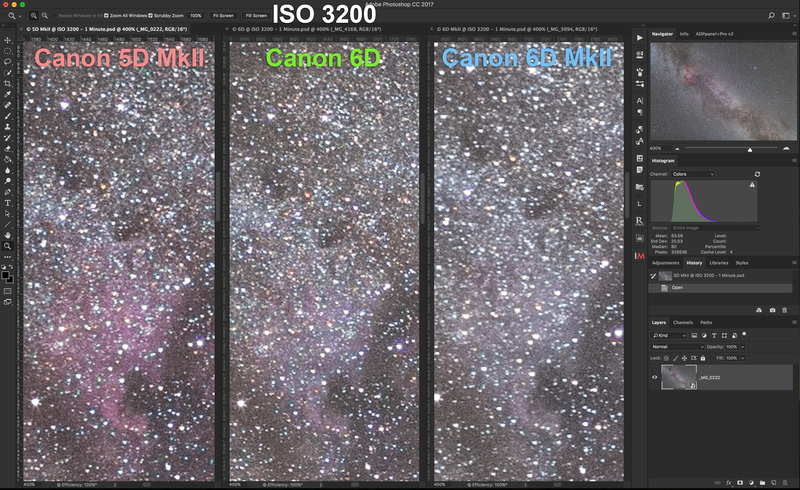 The main image was with a 24mm Canon lens, the bottom image with a 14mm Rokinon lens.